Look in the mirror. The part of your teeth that you can see? That’s the enamel. Tooth enamel is found in the shell of each of your teeth and protects them from damage. Considered the hardest substance in the human body, it’s easily dissolved by exposure to acid or bacteria. 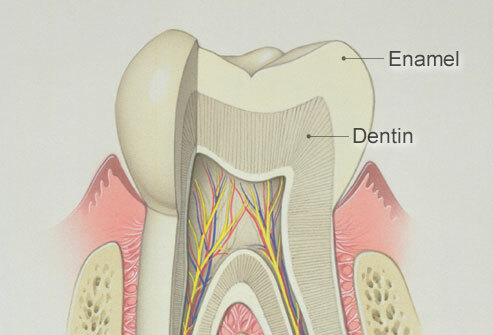 What is the purpose of enamel? Enamel’s primary purpose is to protect your teeth against anything that could cause them harm or you pain. When you’re snacking on chips, enamel protects your teeth from damage that could be caused by grinding your food. When you’re sipping on ice-cold water, enamel protects your nerves from the extreme temperature. How do I protect my enamel? Enamel’s kryptonites are acid and bacteria caused by the foods you eat. Whenever you eat something sugary, the acidity levels in your mouth change and acids attack your teeth. Dentists advise against consuming too much sugar or – at the very least – limiting it to just once a day. Make sure to brush after eating or drinking with fluoride toothpaste. If that’s not an option, chew on a piece of sugar-free gum with xylitol. Drinking milk or eating cheese can also help neutralize acids in the mouth. Other causes of tooth enamel erosion are conditions that cause vomiting or acid reflux or grinding. See a dentist immediately if any of these affect you. Tooth enamel erosion might show up in little ways, but it’s definitely a big deal. The first sign you’ll probably notice is sensitivity to hot or cold foods. At first, it may just be a twinge of pain for a second, but it will get worse. As the erosion progresses, your teeth may start to appear discolored or yellow. They may even appear rounder (because the outer enamel shell is gone) or unusually shiny. When the erosion reaches its worst point or disappears altogether, your teeth may appear chipped or rough around the edges. Once enamel is lost, it cannot reform. The sooner you see a dentist, the better! Treatments for tooth enamel erosion are less intensive the earlier you catch the decay. Most dentists use artificial products to replace lost enamel. Cavities are treated with a filler solution of gold, silver, mercury, or plastic, or in the worst cases, with an artificial crown. There are certain treatments for restoring or regrowing tooth enamel, but they’re currently in the experimental stage.